The pasta partner! Please call us for recipes 1-800-995-7753. http://www.calsundry.com. Product of USA. 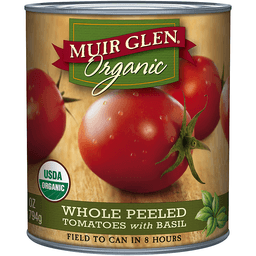 Muir Glen™ Organic Whole Peeled Tomatoes San Marzano Style With Basil. Organically grown in California. Field to can in 8 hours. USDA Organic. Net Wt 28 oz (1 lb 12 oz) 793 g. When we try to pick out anything by itself, we find it hitched to everything else in the Universe. Farm to Fork: Our tomatoes bring bright, bold flavor to the table. 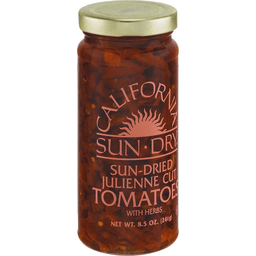 Grown on organic farms where they're drenched in California sunshine, the tomatoes are canned within eight hours of being packed. A gluten-free food. Non-GMO Project Verified. Certified Organic by the Washington State Department of Agriculture in accordance with the organic standards of the U.S. Department of Agriculture. 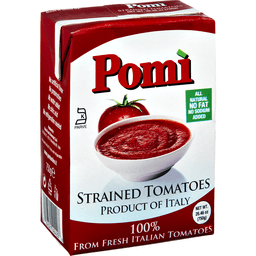 Non-BPA lining*. *For more information visit our website. how2recycle.info. We welcome your Questions or Comments Call 1-800-832-6345 (Mon-Fri 7:30-5:30 CT). Visit us online! www.muirglen.com. © Small Planet Foods, Inc.